You’ll be the hit of the party with a pan of these Blueberry Crumble Bars – perfect for summer’s bounty of berries! Our annual forays to a local blueberry patch will forever be one of the highlights of our summer. We return with pounds and pounds of fresh, juicy berries just waiting to be turned into delicious dishes. The sweet flavor of the blueberries is the star of the show in these easy Blueberry Crumble Bars, and we can’t get enough of them. If you need a simple and quick recipe for a dessert to take to a potluck or BBQ, look no further than these Blueberry Crumble Bars. The crust is also the crumble on top of the bars which keeps prep time and clean up to a minimum. Plus we added a little bit of hearty texture to the crust by using a combination of flour, oats and almond meal. But we didn’t stop there. Since blueberries and almonds pair so well together, we added slivered almonds to the topping for a bit of crunch. Aaaaand then there’s this almond glaze business. Definitely not necessary but always appreciated. Tip: You can also use this recipe for Blueberry Crumble Bars as a plated dessert. Simply cut the bars into larger squares and top with a scoop of vanilla ice cream. With 4 cups of blueberries in this recipe, you’ll definitely want to hit the blueberry patch or stock up on blueberries at the store when they are on sale. But I can think of no sweeter way to savor the peak of blueberry season than with this quick and easy recipe for Blueberry Crumble Bars! 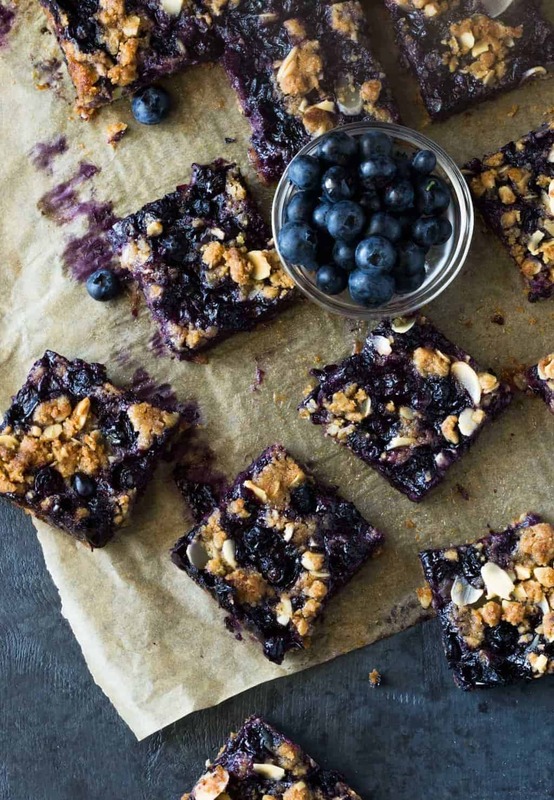 We can’t get enough of these blueberry recipes! 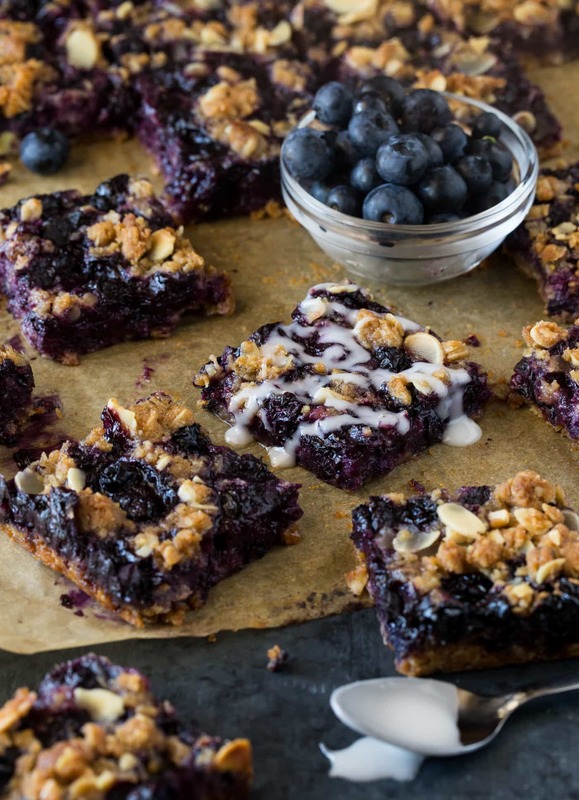 The Blueberry Cumble bars highlight the fruits of summer! Preheat oven to 375 degrees. Add parchment paper to a 9 x 13 baking pan so enough overlaps the sides to use as a handle later. Stir together oats, flour, almond meal, 1/2 cup granulated sugar, brown sugar, baking powder and cinnamon in a bowl. Reserve 3/4 cup of mixture in a small bowl. Press remaining mixture into bottom of parchment-lined baking pan. In another bowl, combine berries, lemon zest and juice, 1/3 cup granulated sugar and cornstarch. Stir until well combined and then pour into baking pan. Distribute berries evenly in pan. Add sliced almonds to reserved oat mixture and stir to combine. Evenly sprinkle mixture on top of blueberries. Bake for 45-50 minutes or until crumble topping is nicely browned. Cool completely. Store in refrigerator until ready to serve. Whisk together powdered sugar, milk and extract in a small bowl. Drizzle over cut blueberry bars. I like to eat these chilled from the fridge, but they are just as tasty at room temp. These crumble bars look so tasty! I think I would also prefer them cold from the fridge. Gotta try! Cold bars, cold cake…my family loves them all. Enjoy! Can I use frozen blueberries here? Hi Magda, I haven’t made these bars using frozen berries, but you can certainly try. I suggest adding a bit more thickener (corn starch) to ensure the extra juices released by the frozen berries don’t turn your bars into a soggy mess. Happy experimenting! Please stop back and let us know how they turned out.